Garlic is a vegetable that has been used for centuries in alternative medicine for its health benefits. It was originally cultivated in central Asia and the Middle East, but has become widely accessible worldwide. Its effectiveness is due primarily to allicin, a sulfur compound that produces several sulfur-containing metabolites that the body can use. Garlic (Allium sativum) is a nutrient packed vegetable that may be used medicinally as raw fresh garlic, dried, aged or powdered extract. Supplementation may improve cardiovascular health, physical vitality, brain function, and immunity. Studies suggest that these sulfur compounds can have cardioprotective properties, and may also help lower cholesterol. Various studies have found that ingestion of a garlic supplement helped to reduce plaque formation in arteries and reduced the risk of cardiovascular disease. Evidence for lowered cholesterol can also be found, but more research is needed to validate this claim. While the differences due to garlic intake were small, the combination of garlic with other treatment and lifestyle changes can produce more significant results. Garlic has also been found to have certain antibacterial, antiviral, and antifungal properties that can be used to prevent diseases such as colds and yeast infections. Preliminary studies also suggest that garlic may degrade carcinogenic compounds and therefore reduce the risk of developing cancer. Further research must be conducted to confirm these claims. This supplement should not be taken if allergic to garlic, and should be stopped immediately if experiencing a new allergic reaction. Garlic has the highest benefit when used in combination with other treatments. It should not be used in place of antibiotics or antimicrobial medications to fight disease. Garlic may have some blood-thinning properties. While there are no known strong interactions with blood-thinning drugs, garlic intake should be monitored if used in combination with medications such as Warfarin. Garlic should not be used if on HIV/AIDS medications, as it can reduce their effectiveness. Garlic can be taken in several forms, the doses depending on which form is taken. Raw garlic can be taken in any desired dose equating to 1-2 cloves daily. Garlic in the pill (capsule or tablet) form ranges in doses from 600-1200mg (5-7mg allicin) daily taken in 1-3 doses. Garlic can also be taken as an aged-garlic extract. This form may have reduced allicin potency, but still contains sulfur metabolites that may be beneficial. This is taken in doses of 2.5-7g daily. 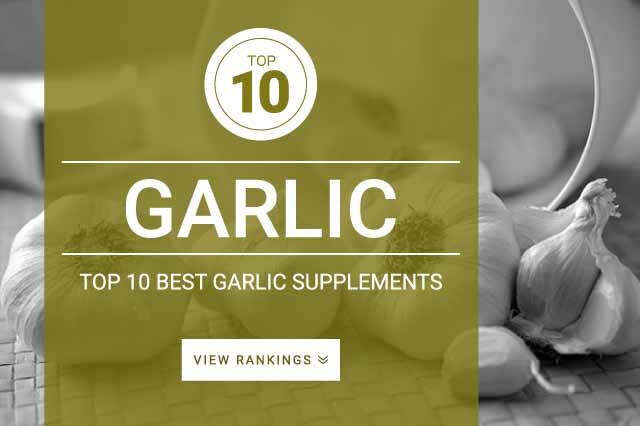 Onlinestrength analyzed 10 best-selling Garlic supplements in the United States, measuring levels of the key active ingredient, garlic (dried, extract, powered, oil), alliin or allicin, as well as presence of heavy metals, preservatives, and watchlist ingredients. Samples of every Garlic supplement passed heavy metal assays. Higher ranked products contained organically sourced ingredients with out the presence of any watchlist ingredients. Products that contained quality ingredients but contained a higher concentration of preservatives were penalized accordingly.